Little Sheep Mongolian Hot Pot - Little Sheep Mongolian Hot Pot offers Mongolian hot pot dining, using a delicious soup made from flavorful spices and ingredients, high quality meats and fresh produce. Little Sheep Mongolian Hot Pot offers Mongolian hot pot dining, using a delicious soup made from flavorful spices and ingredients, high quality meats and fresh produce. Little Sheep Mongolian Hot Pot offers Mongolian hot pot dining, using a delicious soup made from flavorful spices and ingredients, high quality meats and fresh produce. With 36 spices and ingredients in our original soup base recipe, our flavorful broth is sure to satisfy every single one of your taste buds. The highest quality meats ranging from lamb, beef, pork, and poultry are sliced perfectly to cook within seconds of touching the simmering broth. When the mouth-watering scent of our hot pot hits you, you'll be hooked for sure! For vegetarians, we offer leafy greens, mushrooms, and other vegetables that perfectly complement our famous broth. Seafood lovers will also not be left out with our fresh seafood list. Mongolian Hot Pot serves as the forerunner to the modern fondue. Its history stems back hundreds of years to the nomadic Mongols, where tribes would gather together around a fire to cook fresh meats in a communal pot with simmering broth. Hot pot focuses on the fundamental ideas of fresh, healthy ingredients, sharing, friendship, family, and the excitement of gathering around a dinner table. Today, Little Sheep Mongolian Hot Pot continues this culture and offers those same fundamental qualities! 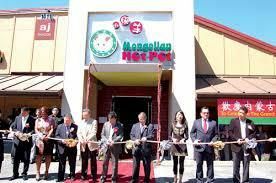 Mongolian Barbecue Restaurant, Restaurants, Chinese Restaurant, Asian, Asian Fusion Restaurant, Asian Restaurants, Asian Restaurant, Fondue Restaurant, Vegetarian Restaurant, Seafood Restaurant.